Volunteers have taken the first steps to restoring a 300 year old listed building in north Leeds. Friends of Gledhow Valley Woods have cleared shrubs and vegetation hiding the Bath House on Gledhow Valley Road - sometimes known as Gipton Spa or Waddington's Bath. Now they want the city Parks and Countryside Department to invest in the restoration of the 1671 building. "It could be opened periodically to the public, such as Heritage Open Days," said Mrs Joan Clayton, Allerton Grange Rise. "It's a little bit of history on our doorstep." "The Friends do not have the resources to take on restoring the building," said her husband Mervyn, "and there would be problems with insurance." "The first task would be to get an architect from a body like English Heritage to say what needs to be done. Countryside Ranger Graham Aston is keen to plant wild flowers in front of the building." Moortown councillor Brenda Lancaster says the bath house is a "jewel" and has pledged to help the Friends. The bath house, a Grade Two listed building, was built by Edward Waddington of Gledhow Hall - hence its alternative name. Sping water enters the building at the back and fills a sunken bath or plunge pool which at times can be over 5ft deep. After bathing in the icy waters, visitors would retire to the adjacent warm room which was heated by two fires and they sat on stone seats. The spring water was also drunk for medicinal purposes. The spa was often visited by Leeds historian Ralph Thoresby who brought his son suffering from rheumatism and ricket, for a cure. In the last 15 years, York Stone roof tiles have been stolen and have been replace with corrugated sheeting which has been vandalised. An internal wooden door has been attacked, graffiti have been painted on the plunge pool walls and some stones surrounding the bath have been removed and thrown into the water. A grill has been placed over the front door to prevent entry. 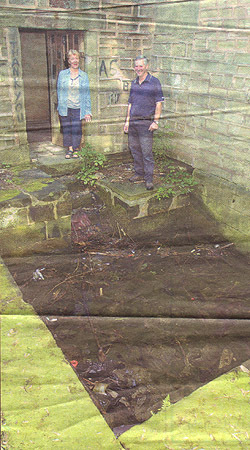 Neighbours complain that land at the rear of the bath house is used by prostitutes who have been seen taking men there. Palisade fencing has been put up to try to stop them. Councillor John Procter, executive board member for leisure, said: "We are assessing a range of facilities for possible Lottery bids and this building features in the discussions."